Share the post "Calycanthus Floridus Or Eastern Sweetshrub: Info And Gardening"
Calycanthus floridus has many common names, among which are Carolina spicebush and Eastern sweetshrub. This deciduous shrub is native to the Eastern United States, from New York and Missouri, south through the Appalachian Mountains, Piedmont, and Mississippi Valley, to Louisiana, and east to northern Florida. It is found in rich low shady woodlands, deciduous or mixed woodlands, along streams and rivers. 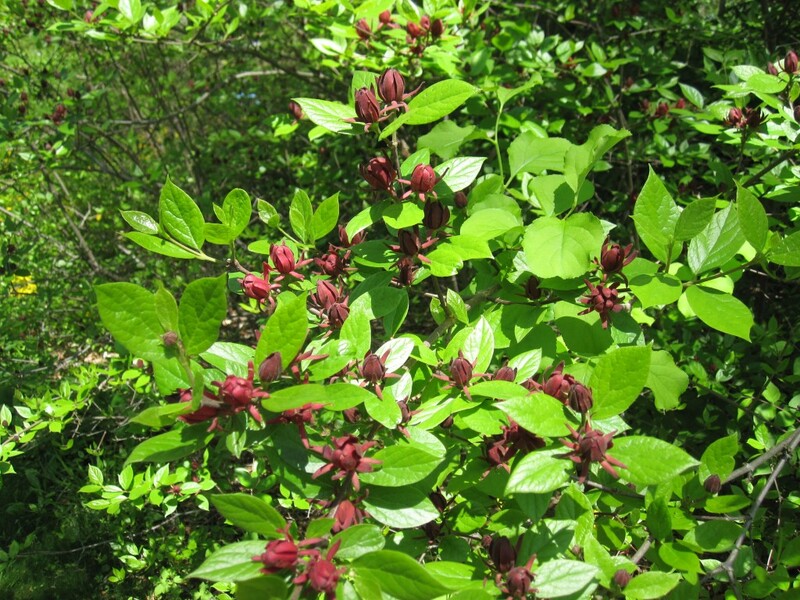 Eastern sweetshrub leaves are opposite, oval with a gracefully and elegantly pointed tip, and satiny-green to dark-green with a lighter gray-green underside. The lotus-shaped flowers can resemble a small magnolia flower. They are axillary, with many brown-maroon, strap-like petals and wonderfully aromatic. Sometimes ago, people would put a bloom in their pockets, so they would smell good when they went to church or to meet friends. Locate your plant near a patio or walkway so the fragrance can be noted. Among many cultivars you can definitely choose the one with the most appealing fragrance: more soured and less fruity, like strawberries or apples. The flowers are hermaphrodite (have both male and female organs) and are pollinated by insects. The fruit is an elliptic dry capsule, containing numerous elongated seeds. Hardiness: USDA Hardiness Zone 5 – 10. UK zone 5. Light: Partial Sun, Partial Shade. Can tolerate shade when grown in warm temperate zones. Fragrant: All parts of the plant are richly fragrant. The flowers have a refreshing scent of ripe apples. The wood, leaves and roots smell strongly of camphor, whilst the bark smells like cinnamon. Time to plant: Plant seedlings late spring or early summer. Plants cuttings of half-ripe wood, July/August in a frame. Culinary uses: It is said that the aromatic bark when dried could be used as a substitute for cinnamon (but see toxicity warnings below). Medicinal uses: Calycanthus were used as a traditional medicinal plant by Native Americans. It is said to have antispasmodic and disinfectant effect. The plant contains an alkaloid that has a powerfully depressant action on the heart. A tea made from the root or bark has been used as a strong emetic and diuretic for kidney and bladder ailments. A cold tea has been used as eye drops to treat a failing eyesight. An ooze from the bark has been used to treat children’s sores, and an infusion has been used to treat hives. Other uses: Calycanthus oil, distilled from the flowers, is an essential oil used in some quality perfumes. The flowers of Calycanthus floridus were compared to a bubble gum scent by one reference. Toxicity: Calycanthus contains calycanthine, an alkaloid similar to strychnine, and it is toxic to humans and livestock. Ruminants are reported to have a toxic reaction from grazing this plant. Some sources say that Calycanthus is toxic only if large quantities eaten. Tips: Sweetshrub succeeds in most fertile soils. It tolerates deeper shade and drier soils, but will not grow as robustly or flower as heavily as you would hope. Any pruning should be done immediately after flowers fade. This plant is resistant to deer. 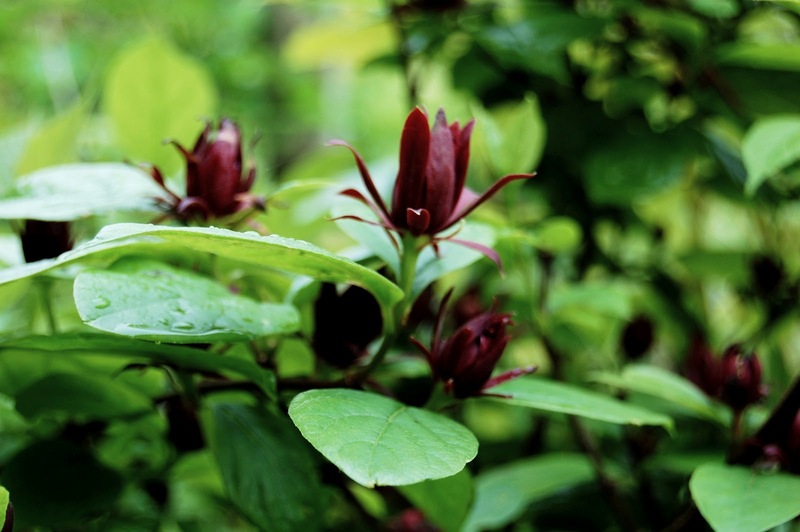 Do you grow Calycanthus Floridus (Sweetshrub) in your garden? What is your experience with this plant? Please share with other fellow gardeners in the comments below! Do you sell Calycanthus Floridus (Sweetshrub) seeds or have plants for sale? You can place your advertisement here. Contact us now!